I was coming outside from the front entrance of a very large building that had double doors on the front of it. On the front walkway, above a 5 step stairway, was a mattress with a thin red cover over it. A woman dressed in a red suit dress either kicked it by accident or tripped on it, but it made her upset, and she went past it, down the 5 steps, turned right on the sidewalk, and then turned right at the corner and as she passed the area I heard her say that she wanted that mattress removed. I recognized the woman as Gloria from "the Young and Restless" TV show. I went over to the mattress and I saw that there were some credit cards on top of the mattress, and when I went to pick them up, I accidentally knocked them down behind the mattress. I managed to moved the mattress enough to fish the credit cards and a single sheet of paper out from under the mattress. Now my Father came out of the building, and wanted to cross the street. I grabbed him by the arm after he descended the five steps to stop him because there was oncoming traffic from the left, and I told my Father he couldn't cross the street by himself, because it took him two weeks to cross the street as old as he was and he couldn't do it alone. Across the street was my Father's red car. I took my Father back up to the building and let him go inside, while I took care of the mattress problem. The mattress had now turned into a bright red car that was open and a voice was coming out of it. I know the voice was my Father, broadcasting from the building. I could shut off the radio in the car and lock the car doors, and before I could do that, a little boy came along and tried to reach the locks on the opposite side of the car - through the back seat entrance, but his arms were a little too short and he couldn't get any pressure on the lock to push it down. I pulled on the back of his pants just enough to stop him from locking the car door. That was my responsibility if it needed to be done, which I knew it did, because I didn't want anyone to steal the car. At this point, the trash truck went by outside the house and half woke me up, but I was still dreaming too. I continued to take control of the car and lock the car, however, the radio was still on inside the car, and the voice said, "There is a hidden assassin with a hidden assassination plot. NOTE: LATER I meditated on this and was told that the two weeks was going to start today - Thursday 6-26-14. NOTE: 6-26-14 - I turned on the news to AL JAZEERA, and at the crawl at the bottom of the screen, it announced that G.M. was recalling 4 million cars from China because of a faulty ignition switch that has resulted in many deaths already. NOTE 2: A little later, the crawl at the bottom of the screen, it announced that G.M. was stopping the sale of their CRUZE car bcause of faulty air bags. 6-27-14 G.M. announces recall of thousands of pick up trucks in the U.S. and Canada. Activists say car bombing kills two people and injures dozens in the town of ... of refugees are also expected to hit 4.1 million at the end of2014. Last updated: 20 Jun 2014 11:49 ... At least 34 people have been killed by a car bomb in central Syria, according to Syrian state television and an activist group. JUST THEN AN ANNOUNCEMENT CAME ON THAT THERE WAS AN ASSASSINATION OF A WOMAN HUMAN RIGHTS ACTIVIST IN LIBYIA. One of Libya's most prominent female activists was assassinated in the restive eastern city of Benghazi when gunmen stormed her house, the state news agency reported Thursday, in slaying that stunned many Libyans. 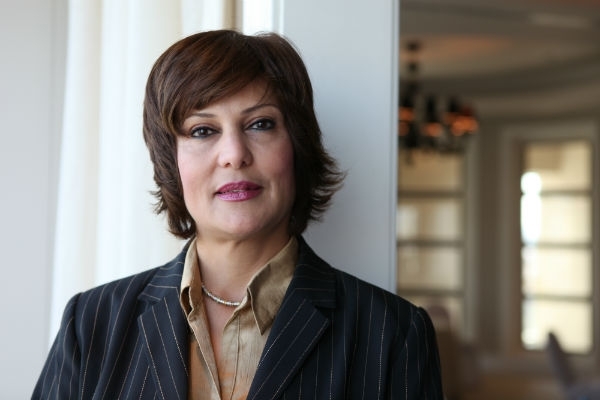 Salwa Bugaighis, a lawyer and rights activist, was at the forefront in the 2011 uprising against dictator Moammar Gadhafi and had since become an international face for Libyans' efforts to build democracy in their country. She was among the most outspoken voices against militiamen and Islamic extremists who have run rampant in the country since Gadhafi's fall. The identity of the gunmen was not immediately known. Islamic radical militias, however, have been blamed for frequent assassinations of secular activists, judges, moderate clerics, policemen, soldiers in Benghazi, Libya's second largest city. Bugaighis was shot in the head on Wednesday night, just hours after casting her ballot in Libya's parliament elections, the state news agency LANA reported. She was rushed to a hospital where she died of her wounds, it said. Earlier in the day, she had been speaking by phone from her home on a Libyan TV channel about fighting raging near her neighborhood, sparked when militants attacked army troops that had been deploying to protest polling station. In the evening, five gunmen broke into her home, the house's guard told police, according to the Al-Wasat newspaper. They first asked about her son Wael, then shot the guard in the leg, then broke into the house. The guard said he heard gunfire from inside. Bugaighis's husband, who is a member of the Benghazi municipal council and was also at home at the time, has disappeared since the attack, the paper and other Libyan media said. Bugaighis had only just come to Benghazi from the capital, Tripoli, especially to cast her ballot in the election, a family friend Hanaa Mohammed told Libya Ahrar TV. She had fled with her family some time back to Jordan because of death threats against them. The son, Wael, survived an abduction attempt earlier in the year. Bugaighis was a well-known figure in Benghazi, where her family is prominent. Since the civil war, she also became one of Libya's main faces abroad, representing the country at international conferences. During the 8-month civil war against Gadhafi, Bugaighis was a member of the National Transitional Council, the rebels' political leadership body. Since then, she was deputy head of the National Dialogue Preparatory Commission, which is trying to work out reconciliation among the country's rival factions, tribes and communities. Her slaying stunned the community of activists, politicians and diplomats. A Libyan human rights lawyer and activist has been shot dead, it has been reported. She was killed just after voting in the country’s elections yesterday while in the home she shared with her husband, who was also in the house at the time of the attack. He has since been reported missing, a family member confirmed. Security detail at the house had also been injured. Bugaighis was instrumental in the Libyan revolution of 2011, following a career defending political prisoners under Gaddafi’s regime. She helped to organise the 17 February 2011 demonstration in Benghazi – one of the first that ignited the political upheaval – and was seminal in the following revolution. Having attained membership in the National Transitional Council of Libya (NTC), she left after four months in protest at the lack of women in the new government. In a 2012 interview with the Global Observatory, a publication of an international think tank, Bugaighis said that while women suffered under Gaddafi’s dictatorship, they are highly intelligent and “active participants in society” often with a higher level of education than that of men. “My main concern is the role of the women in the future. We want equal opportunity in all sectors. We want to ensure that our rights in the constitution will be there. “That’s why when the NTC established and did a proposal for the electoral law in the beginning, and they put just 10 per cent, we were angry about that, the quota, because I know the society is not ready yet because the tribal mentality, the stereotypes of women, we have to work hard to change the mentality of the society. Fighting continues to rage on in the east of the country, where rebel fractions target the military, police and judges. Despite a low turnout, it is hoped that yesterday's vote will provide the country with a new government able to draw up a fresh constitution following the General National Congress' failure to do so. Human rights lawyer Salwa Bugaighis has long been known throughout Libya for her work defending political prisoners during the Qaddafi regime. She played a prominent role throughout Libya’s rebellion, including as an organizer of the February 17, 2011 demonstrations in Benghazi that marked the beginning of the dictatorship’s end. In this interview, Salwa Bugaighis, a prominent human rights lawyer in Libya, describes the current struggles her country faces in forming a new Libya amid strong tribal factions, some who are claiming the right to a semi-autonomous state in eastern Libya. Ms. Bugaighis also addresses another big transition in Libya—the one within the Libyans themselves. “There is struggling inside, the people, but they are really happy. And I’m not worried about what I am seeing in the street, protesting, many demonstrations—they are trying, and they want to make sure there is freedom,” she says. The interview was conducted by Warren Hoge, Senior Adviser for External Relations at the International Peace Institute. Warren Hoge (WH): I’m here with Salwa Bugaighis, who is a prominent human rights lawyer in Libya, and she was one of the organizers of peaceful demonstrations in Benghazi, which is her home, on February 17, 2011, and was one of the founding members of the Coalition of the February 17 Revolution. Salwa Bugaighis, welcome to IPI. I wanted to ask you about the nature of the Qaddafi regime, and by that I mean, how did it affect individual lives? Because I know you believe that this is more than just a transformation of a government, or a regime. It is really a transformation of a society and how people in that society feel about themselves and feel about their country. Salwa Bugaighis (SB): I want to say the first thing that Qaddafi, he thinks that we are six million human beings, nameless. That’s how Qaddafi is looking at us. In our country, when Qaddafi’s regime, there’s no names, can mention except Qaddafi’s names. No heroes, even athletes or singers. We knew after the revolution that there was an office to try to disappear the stars. If there is any names, singers, we have the experience that there were singer idol in Beirut, big event between all Arab countries, and he won and after that when he come back to Libya, and we didn’t hear about him, he disappeared. So, now I want to tell you that the whole population needs rehabilitation from Qaddafi’s regime. Comprehensive repression for all the people, all the details, chaos, turmoil that he tried to put the country through during the 42 years, so he tried consolidating power in his hands and demands the various state institutions. WH: Does that mean that it is difficult for individuals to realize now that they have individuality, that they have power, that they have the right to say what they think? Are they so conditioned that it is more difficult for Libyans than maybe for some other societies to exercise the rights which they have gained through the revolution? SB: Now we have transitional time. Now people are happy to practice democracy and I want to tell you that after the revolution in eastern parts, within no time there were more than 250 NGOs, and more than 100 newspapers. Every time there is protesting in the streets, they are trying to know what is the limitation for the democracy, how to practice, how to achieve the objectives, and really, they are doing great for what has been achieved just during one year. I think we really did a great change. There are NGOs now, they are trying to play strong role to raising the awareness for the election and raising the awareness for human rights, for women’s rights, and to talk about what’s the constitution, because we don’t know anything about the constitution. What is the constitution? We knew that all the countries have the constitution. And we want the constitution to protect our country, but we don’t know what it is. What’s the parties? Why must there be parties in our country? Now we are trying to join parties, and some of the people, they are afraid, because during 42 years, it’s a crime in our law if you join any parties. So, there is struggling inside, the people but they are really happy, and I’m not worried about what I am seeing in the street, protesting, many demonstrations, they are trying and they want to make sure there is freedom, all the people are free to say what they want to say, but we have to learn there’s always limits. You have to respect the privacy of the others; you have to respect the other opinion. Because during 42 years, there is just one thinking, Qaddafi’s thinking, and Qaddafi’s theory. So, it is difficult to let the people to respect another opinion. Everything is new. It’s like when you build a new building and you have to start from scratch, and now we are really started, and we can’t see the building, we have to wait. We have to be patient, we have to give us some time to moving to a democratic country and I’m really optimistic about our people. I can see in their eyes that they want to be civilized, they want to go fast, jump. They don’t want to wait. They have high expectations. It is difficult to deal with it, but they will learn they need some time, and we will see because there is big will in all of our people. WH: I want to continue that thought because I know there is a great willingness in the Libyan people to move forward, to take advantage of the new freedoms they have, but I also know that Qaddafi did not leave very much behind, that you have a great absence of infrastructure in Libya, as opposed to Tunisia or Egypt. Can you talk about that? SB: Qaddafi destroyed all the institutions. We have to start from scratch, we have to build our structure, we don’t have structure, we don’t have, even job description. Everything is big chaos, and lack of information. We don’t have infrastructure. We have to take care of our education, our healthcare. Most of our people just traveling to another, neighboring country to go to hospitals, good hospitals for treatment there. We have many things, you can’t believe it. When you dumped all the sewage in the sea, we have amazing places in Libya, during 42 years nobody knows about it. All the foreigners during this revolution, when they came to Benghazi and visited the Serena, As-Shahaat, and they were amazed, ‘Oh my God, we didn’t know about that’, and we have different places for tourism. This is source for us, for the future. We have to look, not just for oil revenues, but we have to look for rational, viable economy. We have to make strategic for the future, for all Libyan development, not just centralized, Tripoli or Benghazi. All the cities, all the small towns. They want to let them proud that they are Libyans, in the future. WH: Salwa, I want to ask you something about what happened in your home city of Benghazi last week. That was the declaration by the militia leaders and tribal leaders that they wanted a semi-autonomous state in eastern Libya. Is that something that would be popular with other Libyans? Is this something that could threaten the desire to create a centralized Libyan state? SB: It’s not from the militias. There were groups of tribals. Tribals and there’s some militias believing in federalism, but most of them tribals thinking, and because we suffered for 42 years from centralization from Tripoli. I don’t want to say it’s Tripoli, because Qaddafi and his sons and his daughter were there in Tripoli. That is why everything is there. These people, they thought that because of that, and because of poor representatives of the NTC and the transitional government, they thought the people, they want the federal, and when they declared that they were disappointed and they were shocked because there were hundreds of thousands were in the street. They said from the day one that we want united Libya, we don’t want to divide Libya. We didn’t even accept during the revolution when there were many proposals to divide Libya in two. Even they said that the martyrs fought because they want one Libya. So we have to respect their will for that. We answered back and said that we respect the theory, but they have to respect the people who are in the eastern part of the country and they have to wait until we write our constitution. Until that time, they can’t say what they want exactly. If they want to do a party or any kind of organization to support this idea, it’s democracy, so they can do. But don’t do anything against the will of the people. WH: I know you went to Tunisia to watch the process in Tunisia. I would be interested in knowing what you thought of it, and whether you learned any lessons which you can apply to the situation in Libya. SB: I visited Tunisia during their election and I really was amazed. For me, it was the first time for me to be in this atmosphere. I saw in Tunisia they have really strong infrastructure, they have database, they have strong NGOs there, very organized. They know exactly what they want to do. One of the NGOs trained 4,000 youth to be ready. Yes, their name is Muraqiboon and there’s another one, Shahid, more than a 1,000. I am really impressed about what I saw there, but I want to mention something. I saw there were more than 80 parties there and they were similar platform for most of the parties. In my opinion, that’s why An-Nahda won. It’s because many of the parties established after the revolutionaries, and they paid the price for disorganization and poor strategy consideration. An-Nahda, they know exactly that the most important thing, the voter outreach and the small towns is more important than advertisement. Because of that, An-Nahda won 40 percent. So if they were a coalition, maybe they will win, the percentage will be less than that. So, when I came back, I talked with many people about that and there were many proposals about that, to make something, coalitions. We did discuss about that, and last month my parties involved to put the proposal with many of the parties and they organized a coalition. There were 40 parties and individuals and civil society. We were not against Islamists or Muslim Brotherhood because we are partners in Libya. But we want who represents us in the national parliament must be all the Libyans there, all the ideologies there. Even some people they don’t have any ideology. Just they want freedom, social justice, and they want a better life. Because we want to write our constitution so it must be all the people believing in this constitution. They believe that they share to write this constitution. So it’s not fair that like 50 or 60 percent will be Muslim Brotherhood or Salafi because the majority, they are not Muslim Brotherhood or Salafi. They are very good organized. They know exactly how to work. Most of the Muslim Brotherhood, they were abroad for many times, so they are intellectual, they are very sophisticated, and they have structure, and they have experience in parties. The others established just fi ve, six months ago. They are new in this. They don’t know, even the mechanism of parties. Under this coalition, we hope we can do something, and we have high hopes for this coalition and today we have another meeting, big meeting in Benghazi because the first meeting was in Tripoli. And the second meeting in Benghazi, and the third meeting will be in Sabha, in the south. Even today in Benghazi, we are trying to let the people know about the coalition, because there is many principles and many articles are agreed, and they have to see what is inside it. And we want the Sharia, the source—it’s not the only source. We want it, we are Muslims, we are proud that we are Muslims but we want moderate Islamist. We want Libya like that. You can see they are liberal in their behavior. Why we don’t want the source? Because I want to tell you during 1,400 years, some of the articles in Quran, there’s many people that they explained in their way, so we don’t know who will come and explain for us, so we want it one of the sources. We have the agreement, we have international law, we have many sources and there’s another thing that we are worried about. The NTC, they established a new law for the Mufti, and really, we are worried about it because we are afraid maybe there’s a new Khomeini will come out of that. Because in that law, in one of the articles that nobody can sue him. We are not agreed about that. And he will stay all his life and he will be involved in politics. That is why most of the people now worried say that now they are Velayat-e faqih [theocratic rule, propagated by Aytalloh Ruhollah Khomeini in Iran]. Valayet-e-faqih is the same as Iran. It’s the same as Khomeini. Really, we are worried about this and many of the people, the intellectual people, they are trying to write about this, and the youth were talking through the Internet. This is really, it’s good because we are—some people using the religion like a red line, “you can’t talk about this, it’s very sensitive.” But we are all Muslims. We are proud that we are Muslims, so please don’t do this to us and don’t threaten us with our religion. We respect our religion, we are proud but we don’t want a new Khomeini in Libya. WH: Sounds to me what Libya needs is a good lawyer, and I am glad to hear from you that they have one. The last thing I want to ask you about is, when you went to Tunisia, you obviously saw that women in Tunisia seemed to have gained great representation. There are large numbers of them in the new parliament, in Tunis. What is the situation of women in Libya? SB: I want to tell you that the role of the women during the revolution was very effective, and very strong. I want to tell you that women in Libya, they are educated women and very active participants in society. I want to tell you that in high degree, in educational institutions, it’s estimated to be 60+%, compared to the males, Masters degrees and PhD. Women suffered from Qaddafi’s regime, in prison, economics, etc. Now they are looking to play a great role in the future. My main concern is the role of the women in the future. We want equal opportunity in all sectors. We want to ensure that our rights in the constitution will be there. That’s why when the NTC established and did a proposal for the electoral law in the beginning, and they put just 10 percent, we were angry about that, the quota, because I know the society is not ready yet because the tribal mentality, the stereotypes of women, we have to work hard to change the mentality of the society. They respect women and women are in all sectors, they are in huge numbers in the workforce. But, because for 42 years, the people didn’t see women ministers, 42 years there were 132 male ministers and just 3 female. Even psychological, for 42 years, you see this is a role for the men. We have to change the mentality; we have to change the curriculum. All the subjects about women, she’s cooking, she’s cleaning, raising the children, and the man is going to work. So we have to change this to put figures of strong women in the curriculum, as leaders. There’s another thing, we have to make the strategy in the media to raise awareness of women’s rights, to change the stereotypes of women, as we saw in the Executive Office, even in the new government, that they put the woman in Social Affairs because this is for women and the pressure of international countries, they just put 2 women in 24 ministries. I am optimistic, but we have to wait, be patient. Maybe after 10 years we’ll see a big change for that. But now we are trying to talk about the quota to not just the electoral law but we were talking about the party law. We want 30 percent in all the parties, it will be one of the articles, if you want to legislate the parties, it must be no less than 30 percent women. So we are talking about that, and we are talking about the quota, because nobody knows anything about quota. And the last proposal, when we were protesting against 10 percent and they changed it, thanks to God they changed it, and they did a list and it’s one-by-one in the list. One male and one female. It will be 200 seats in the next parliament, 120 individuals. We have no hope no female will win in 120 because society is not ready yet. But in the list it will be 80 seats, maybe they will be 33 seats for the women. Almost 12 percent or 13 percent. It’s okay. We were not happy about that, but we have to go on and struggle for our rights. I hope the future will be better. WH: I am very glad that you came to the IPI today to talk to the Global Observatory. Thank you, Salwa Bugaighis. SB: Thank you, thank you very much. Aug 13, 2008 ... Editor's note: Because the first assassination was a Democrat working for the Clinton's, I have to ask if the others will be also. Time will tell. Mind Control, the Illuminati and the JFK Assassination ... I offer the reader sources of information about the Illuminati and the One World Government to . are the bullet that killed Abraham Lincoln, Paul Revere's dental tools, ... it occupied Ford's Theater after the assassination of Abraham Lincoln at the . Feb 27, 2007 ... Vice President Just Misses being Assassinated .... ASTROLOGY OF THE POSSIBILITY OF BUSH ASSASSINATION By Marguerite dar Boggia. POPE JOHN PAUL II ESCAPED ASSASSINATION 4 TIMES 4-24-2001 - WHY ARE 12 CREWMAN ... www.greatdreams.com/warndrms.htm -. www.greatdreams.com/lincoln.htm - Similarto WHY DID ABRAHAM LINCOLN FREE THE SLAVES? Conspiracy related discusion about PINDAR...........The Lizard King?????????? in the Above Top Secret website discussion forum Ancient & Lost Civilizations. Oct 7, 2004 ... From the assassination of the last American President to have stood against these forces, John F. Kennedy, to the murdering of his son, John F.
PEAS, BEANS, AND BARLEY ... OHHHH! Sep 21, 2000 ... ... something disastrous happening elsewhere in the world that could affect our national security, such as the assassination of a political leader. Jul 30, 2001 ... Before we get too critical, we should remember that many details about the JFK assassination have still not been released to the public. **The president of France will be assassinated, and also the leader of Germany. * *The U.S. will be invaded and occupied for a period of six to seven months. Jun 1, 2008 ... I had to go through the basement garage where a middle-aged white woman was soliciting funds so she could fun an assassination. Feb 24, 2012 ... Licio Gelli, headmaster of P2 masonic lodge, and mafioso Giuseppe "Pippo" Calò , are being prosecuted for the assassination of Roberto Calvi. Feb 22, 2014 ... Mind Control, the Illuminati and the JFK Assassination ... I offer the reader sources of information about the Illuminati and the One World . Nov 3, 2013 ... New York, 1829; Massachusetts, 1834; and Pennsylvania, 1836. .....Truth About The Assassination Of Abraham Lincoln, Burke McCarty, 1973, . ... "No, this is the biggest thing to happen since the JFK assassination. We are on the verge of alien disclosure -- something we have been seeking for decades." Jan 30, 2001 ... ... FBI targeted the "AIM Leadership" for neutralization, either by embroiling them in endless, fabricated court cases or by outright assassination. Jan 7, 2012 ... Retrieved 2011-10-02. ^ Nieves Matthews, Francis Bacon: The History of a Character Assassination (Yale University Press, 1996), pp. 44–45. ... event with the birth of Jesus, just as the eclipse had been correlated to the death of Herod and a comet with the assassination of Julius Caesar in 44 BCE.